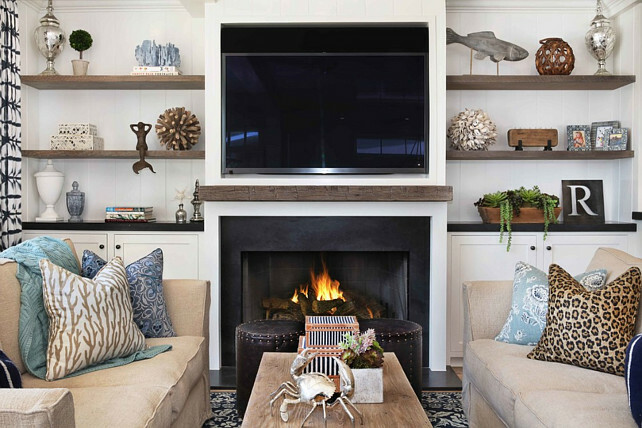 Designed by Blackband Design and located in Newport, California, this home was designed with a classic navy blue and white color palette, welcoming dreamy ocean views which can be seen from the main rooms. 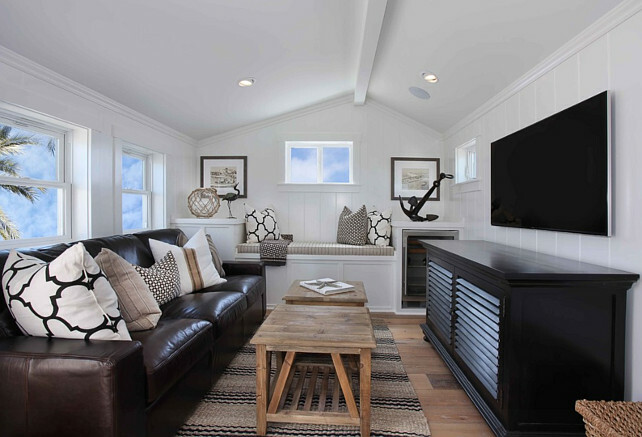 With its Cape Cod inspired design, this beautiful beach house is great for entertaining! It features a practical kitchen with trendy countertop choices and plenty of bedrooms for all the guests. A modern twist was added to its coastal interiors, making this beach house a magical place to live or spend your summers in. Let’s start dreaming! 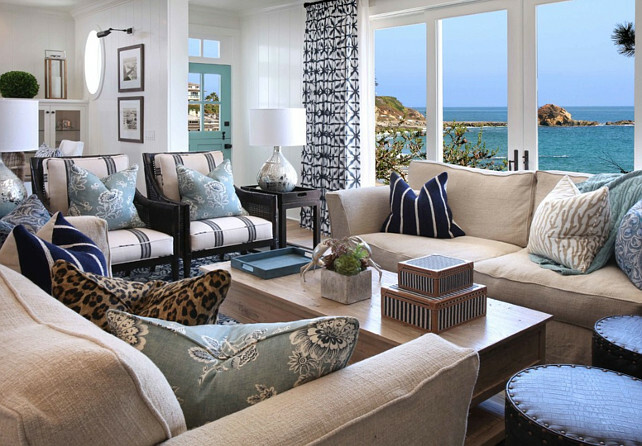 With close-in ocean views, this living room is the most popular room in the house. 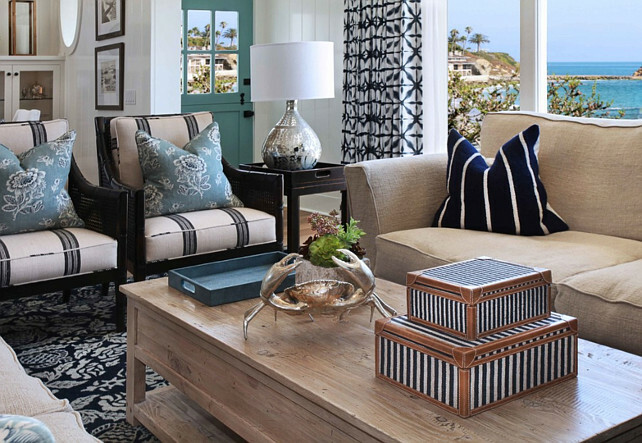 Neutral furnishings are complemented with a classic coastal palette. I always like to display something special and unique on coffee tables. This is also an opportunity to tie the space together. Here, the designer continues applying the neutral and navy blue and white color palette. Beautiful! I often have clients wondering how they should decorate their bookshelves. I recommend you to display things that are important to you, but at the same time, try to keep an cohesive aesthetic. 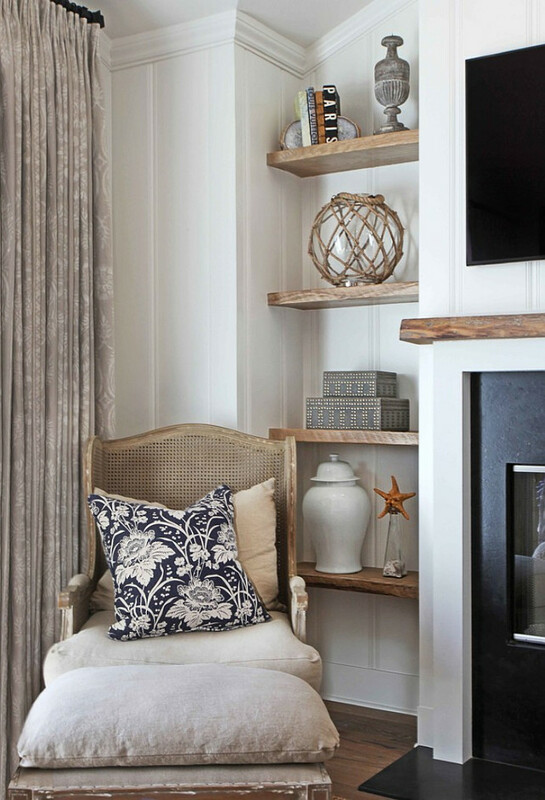 Since this is a coastal home, coastal decor was beautifully added along with personal items, such as the family photos. The kitchen features white perimeter cabinets topped with honed granite countertop. 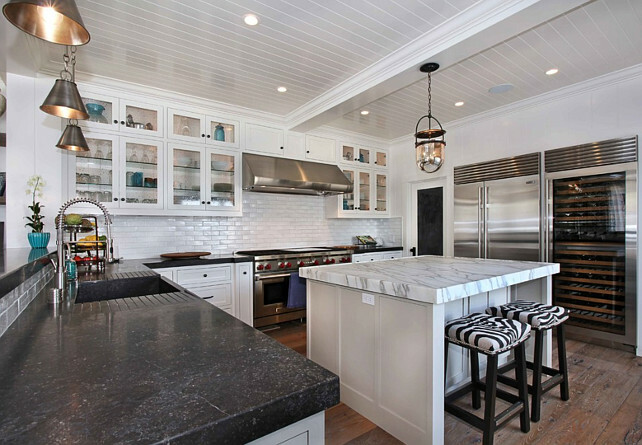 The kitchen island features white marble countertop lined with zebra barstools. This kitchen feels clean, fresh and timeless. 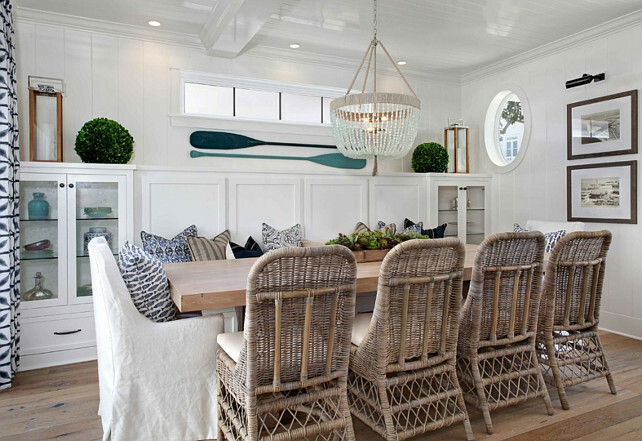 This chic coastal dining room features a turquoise beaded chandelier, “Ro Sham Beaux Malibu Chandelier”. I love this room! The paint color in the entire house is: “Dunn Edwards Droplets”. 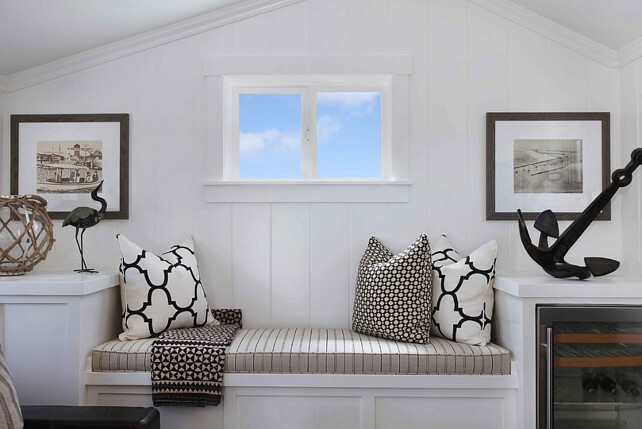 Adding window seats is something that I often recommend to my clients. 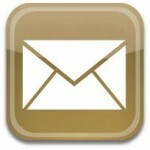 I feel they are worth the investment and you always see the return should you want to sell your house. 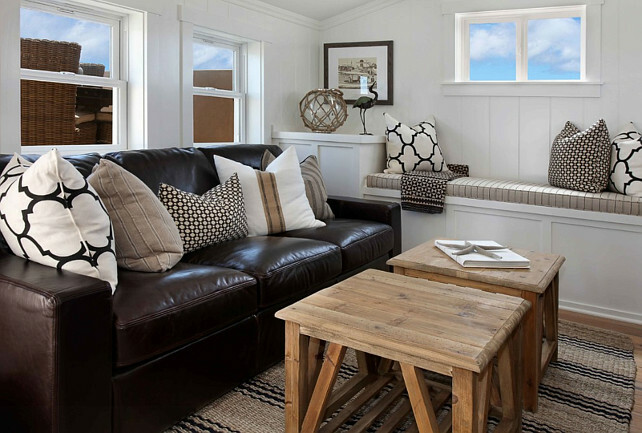 They not only add character and a “custom feel” to your home, but they also add extra storage, which is bonus! Great splashes of dark browns and black give a more masculine approach to this space. 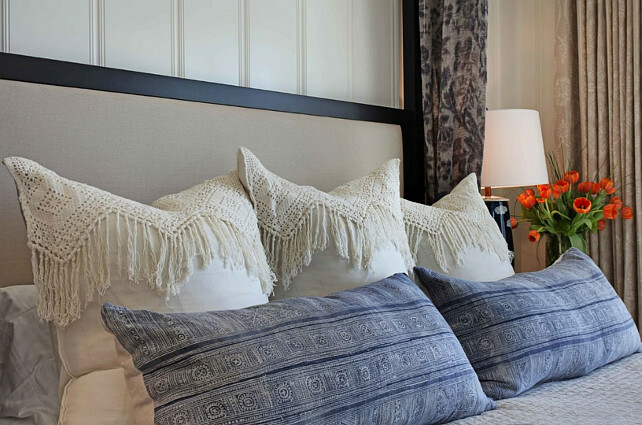 This small bedroom is all about embracing comfort and coziness. This bed adds character and storage (see picture above), which is always a must in any small space. 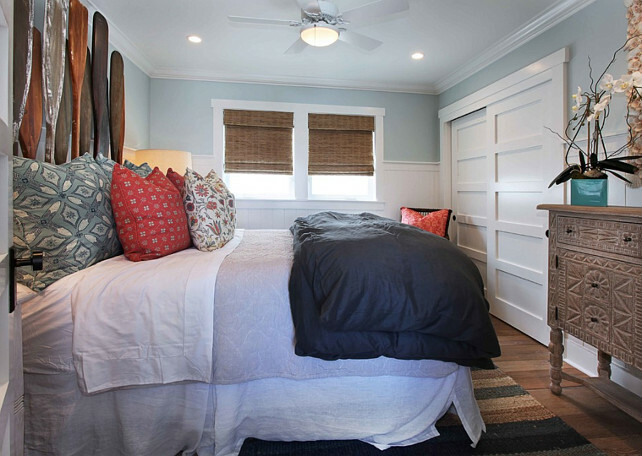 This coastal inspired bedroom has a casual feel, which is perfect for teenagers. Isn’t this cool? 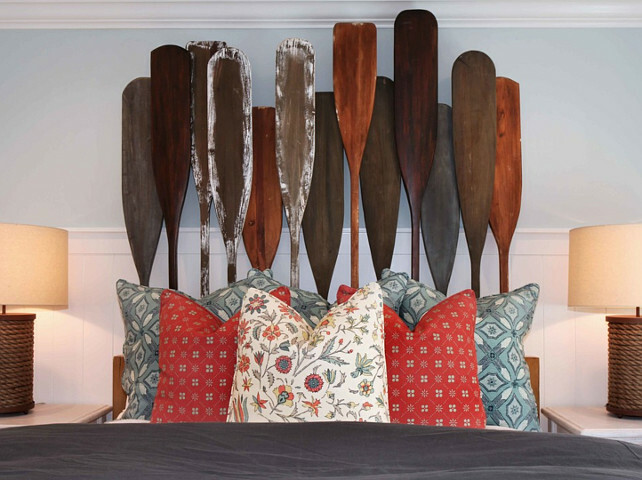 Great idea for coastal homes! This might be a small bedroom, but it is certainly big in personality. What guest would not adore this space, right? 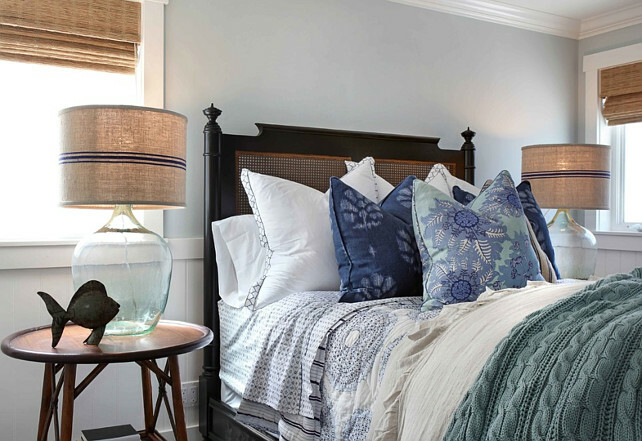 The main color palette of the house is brought also to this stunning master bedroom. Classic elements get a fresh approach in this room. 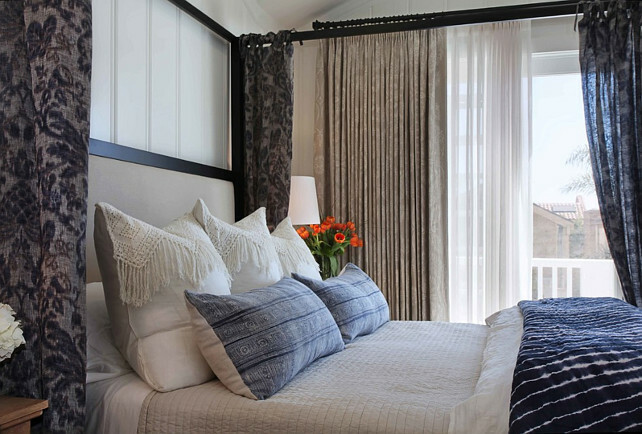 Gorgeous draperies adds privacy and a sense of coziness to this bed. A romantic take on blue and white decor. 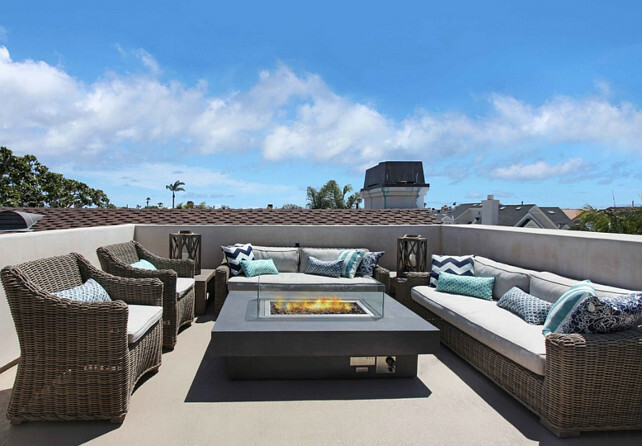 This roof top offers amazing ocean views (not seen here) and lots of privacy. Wouldn’t be great to spend hours here with some close friends? How are you all doing this Tuesday? I am feeling so good! Let me tell you this… I always have loved coffee and I remember asking my mom to drink coffee since I was a small child – not that she would le me, but I was always asking! 🙂 The smell of fresh coffee always got me and the taste? I simply never thought I could go for a day without my morning cup of java. This is changing for me… sadly. I decided to quit coffee since last Saturday because I have being going on treatment for stomach ulcer since last April and it gets more painful every time I drink coffee. I felt so down the first day without my caffeine. I had a huge headache and felt without any energy. And look, I used to drink only one to two cups of coffee a day! I admit I am missing coffee terribly! I wake up every morning craving it and my breakfast just lost a little of its appeal to me, but let me tell you… I have so much more energy and my pain in my stomach is finally disappearing! Like my husband said today, I don’t have to quit coffee forever, but at least until I am feeling 100% again. Meantime, I will keep focusing on the positives of taking a break from it. Have you experienced any change in your body after quitting certain kind of food? It’s amazing how simple changes sometimes can bring you to feel yourself again, isn’t it? I also LOVE my coffee but have dramatically cut back after also having stomach issues, the caffeine is terrible for the stomach lining..i have learned to love an enjoy tea. Mighty Leaf is the best! I still miss my coffee but have it on occasion and not nearly as strong as i used to drink it..such is life! This house is GORGEOUS, so my taste, love how cozy the bedrooms are and the dining area is fabulous. The perfect beach house indeed. Feel better…..trust me you are doing your stomach a world of good! Oh Luciane. I, too have had to cut coffee out of my day because of fibroids in breast tissue. There have been no issues but I noticed tenderness after drinking coffee. New breakfast; Smoothies! Fruit and veggies with seeds and nuts, coconut water and so delish. Healthy feels better all the way around. Whiter teeth, too w/o coffee. Continue to feel and be great! Thanks for a lovely blog. One of my favorites. I love coconut water and drank some yesterday and replaced my “coffee” this morning for a coconut juice that seems to be super healthy. I will look into some smoothie recipes. It’s very cold around here right now, but it would great when the weather gets better. Thank you for posting this house, it has so many masculine rooms in it. I have 4 boys but I have girly taste so it is a nice change for me to see examples of rooms that I like that aren’t feminine. Keep making good choices for your health, you won’t regret it! Amei aquele canto de refeições! I sympathize with you on your decision to give up coffee. It’s so hard to do! Though I’m drinking coffee now, I did give it up a number of years ago. Most people notice that they feel better without coffee and I think that was true for me, too. I realized what a powerful drug coffee really is when, after having none for weeks, I drank a cup because I had to make an emergency trip that required driving five hours. Well, it sent me into overdrive! You’ve inspired me to at least cut back for now. PS: I just took a look at your Etsy store and I am loving the kids pillow cases! So cute!!! 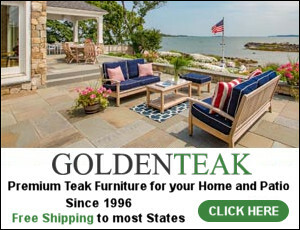 Thank you for posting this beautiful home! Any idea what the flooring is? The color is perfect for the decor of this home. Please advise if you know. We are planning a summer house build and I get many many ideas from your site! 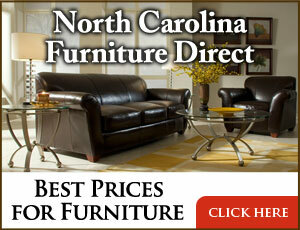 I am happy to hear you’re planning your summer home and find many ideas here. That’s really great, Karen! I don’t have the source for this specific flooring, but by looking at them I would say they’re Wide Plank White Oak Hardwood Flooring. Some places they seem to be reclaimed, like on the kitchen, for example. Feel free to contact the designer for more information. Good luck with your house, Karen and let me know if you need anything else. Thank you so much for sharing your pics. The bedroom which you shared as “small and embraces….”- just wondering about the bed itself. 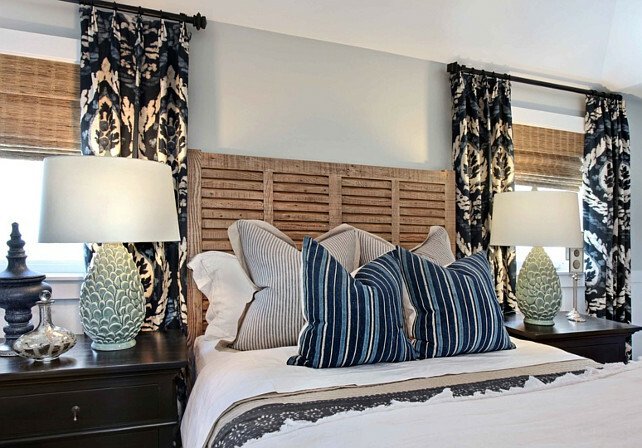 I love the Plantation style headboard and the fact it has the storage. Do you have any information you can share about the manufacturer? Thank you so much.